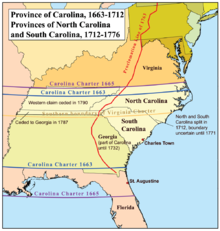 South Carolina had recently been involved in a costly legal battle with Georgia over a small number of islands in the Savannah River, and wanted to avoid the expense of a lawsuit regarding the North Carolina border, so the two states agreed in 1993 to cooperate in resurveying the border. The effort included using colonial-era maps to reconstruct the positions of trees making the border that had long since died, and tracking down the original positions of stone markers that had been moved. This page was last edited on 18 April 2019, at 02:45 (UTC).